New for July is Mele & Pere's Italian pub grub at te Sun & 13 Cantons on Beak Street, Soho. Meatballs, braised beef burger, spaghettini with clams and mussels... Open daily, apart from Sunday - go and try some. "From Monday 30th June for 1 month, Italian trattoria Mele e Pere will be hosted by the iconic Sun & Thirteen Cantons pub for an exciting and unique pop up in the heart of Soho - Mele at The Sun & 13 Cantons. Head Chef, Andrea Mantovani, from Soho trattoria Mele e Pere has put an Italian spin on their dishes. 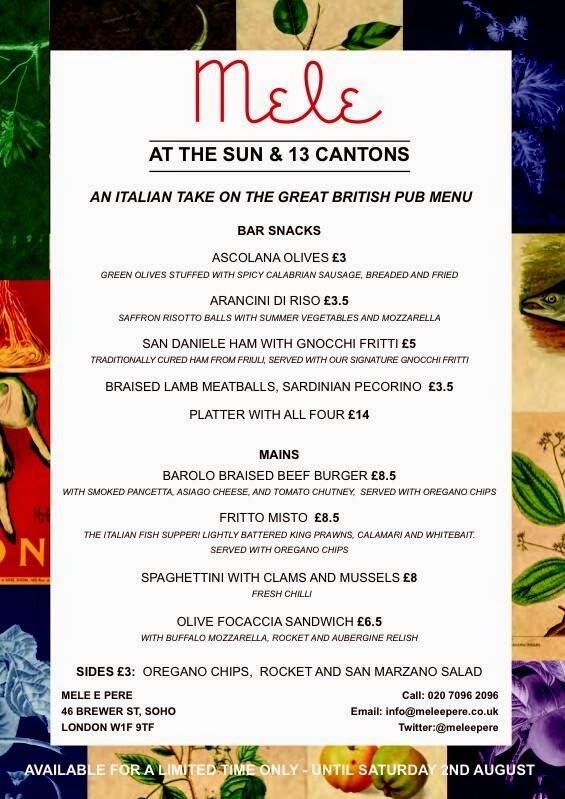 For a month they will be serving "Italian pub food" at neighbouring pub, The Sun & 13 Cantons as part of their renowned pop up schedule. Using ingredients from Mele e Pere, Andrea has devised dishes to fit the relaxed nature of this traditional English pub. The simple menu will include bar snacks starting from £3 such as San Daniele ham with gnocchi fritti or Braised lamb meatballs with Sardinian Pecorino. Or try a platter with 4 snacks for £14. Main courses from £6.50 vary from Spaghettini with clams & mussels, an Italian fish supper of Fritto misto to an Olive Focaccia sandwich with buffalo mozzarella, rocket and aubergine relish. And no, the classic burger has not been forgotten, just given a twist by using a Barolo braised beef burger served with smoked pancetta, asiago cheese and chips. Andrea comments, "This is our first residency and we are delighted it’s with our great Soho local, The Sun & 13 Cantons! We wanted to come up with dishes that would be relevant to British summertime food, but with an Italian twist. We think this is a fantastic opportunity for us to be able to work with our neighbour to create something new and exciting for both our customers and hope this will encourage further projects in the near future." For bookings please contact The Sun & 13 Cantons. Please note there are no reservations after 7pm, when tables will be on a first come first served basis." When - Monday 30th June - Saturday 2nd August.